As the school year shifts into high gear, we are getting a lot of questions about our service. Here are answers to the most frequently asked questions. Learning List is a subscription-based instructional materials review service designed to help improve student learning by empowering educators to chooseand use instructional materials most effectively. What types of materials do you review? English and Spanish versions of materials. Austin TX, October 1, 2015 – Learning List launches new Spec Sheet reviews and Explorer tool at the TASA/TASB Convention in Austin, Texas. According to the Texas Education Agency, Texas school districts have already spent over $250 million this school year on new instructional materials. If history serves as a guide, many of those products will go unused because they will not live up to the publisher’s claims. The challenge of finding high quality instructional materials is exacerbated as districts increasingly transition to a blended learning environment with either 1:1 or Bring Your Own Device (BYOD) initiatives. Now, not only must administrators find instructional materials that meet their students’ academic needs, but the materials must also work with multiple devices, browsers and operating systems. District staff seldom has the time and/or expertise to thoroughly review the academic attributes and technology requirements of instructional materials before the district decides which products to buy. Learning List’s new Spec Sheets and Explorer tool help districts meet that challenge. The Explorer tool helps educators navigate the vast (and expanding) universe of K-12 instructional materials to find products the meet their academic and technical specifications. The new Spec Sheet, Learning List’s two-page checklist of a product’s key academic attributes and technology requirements, will help curriculum and technology teams quickly narrow the list of available products they need to review themselves. “We have found that reviewing the technology specs of a product is just as critical as reviewing the academic side of materials. If your district’s technology is not compatible with the specs of the product, your teachers won’t be able to use it. So regardless of how good a product is instructionally, if the square peg doesn’t fit in the round hole then you are just wasting money. Learning List’s new Spec Sheets are going to make shopping for instructional materials much less time consuming and will give districts of all sizes greater confidence in the products they select,” Matt Tyner, Textbook Manager for Dallas ISD and Executive Board Member of the Instructional Materials Coordinators’ Association of Texas (IMCAT). The Spec Sheets are consistently formatted to make it easy for educators to compare critical product features. These at-a-glance reviews complement Learning List’s more in-depth Alignment Reports and Editorial Reviews. Subscribers now get three independent, professional reviews to help inform their buying decisions. Learning List is an instructional materials review service for schools and districts. With subscribing districts in five states serving over a million students, Learning List has reviewed more than 1,000 preK-12 products in the four core subjects. Learning List reviews both textbooks and digital instructional materials upon subscribers’ requests. “Learning List is a service for schools and districts. Our subscribers asked us for help verifying and comparing products’ technology requirements. The Spec Sheet and Explorer tool are our latest response to districts’ need for high-quality, transparent information in the rapidly evolving K-12 instructional materials marketplace,” said Jackie Lain, Learning List’s President. About Learning List –Learning List is the industry-leading instructional materials review service for schools and districts. Like Consumer Reports®, Learning List provides independent reviews of preK-12 instructional materials to help administrators choose and teachers use materials effectively. For further information about Learning List’s Spec Sheets and/or new Explorer tool, contact Cindy Ryan at Learning List 512-852-2132 or CindyR@LearningList.com. 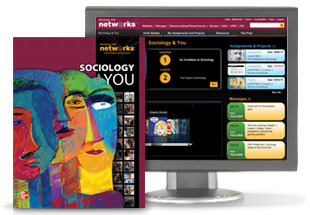 McGraw-Hill Education’s Sociology and You is a comprehensive sociology course for high school students that includes print and online resources. The course introduces students to the study of social structures and includes engaging multimedia features, such as videos and interactive learning tools, which support instruction in blended learning environments. Learning List has recently completed a review of Sociology and You. Sociology and You addresses how social structures shape human societies and behavior. Content is organized using Understanding by Design® (UBD) model, which frames instruction in terms of “Enduring Understandings” and “Essential Questions.” Chapters open with essential questions to guide students’ thinking and include a “Technology and Society” feature that examines how technology influences social experiences. Chapters include primary source documents for analysis and hands-on projects. Lessons begin with lesson-specific essential questions, a brief overview of content, and an explanation of why it matters to students. Students have access to a glossary in Spanish and English and online libraries of “Skills Builder” and “Test Prep” resources. Skills Builder resources address geography, research, writing, and presentation skills and include links to college and career readiness development materials. The Test Prep library provides rubrics and resources to improve test-taking skills. Click here for an outline of the course or here for a program overview. Sociology & You is written exclusively for high school to introduce students to the discipline of sociology and the sociological study of society. McGraw-Hill Education believes that their contribution to unlocking a brighter future lies within the application of a deep understanding of how learning happens and how the mind develops. It exists where the science of learning meets the art of teaching. Educators have been and always will be at the core of the learning experience. The solutions McGraw Hill develops help educators impart their knowledge to students more efficiently. McGraw Hill believes that harnessing technology can enhance learning inside and outside of the classroom and deepen the connections between students and teachers to empower greater success. By partnering with educators around the globe, McGraw Hill learning engineers, content developers and pedagogical experts are developing increasingly open learning ecosystems that improve pass rates, elevate grades and increase engagement for each individual learner while improving outcomes for all. Why? Because learning changes everything. * The content in this section is provided by or adapted from McGraw Hill Education. LearnZillion is an online, open educational resource (OER) that provides supplementary English language arts and reading (ELAR) instructional materials for grades 2-12. Resources are free and address the Common Core State Standards (CCSS). Instruction focuses on developing students’ close reading, writing, and language skills and supporting teachers’ understanding of the CCSS. Content is presented in short video lessons that include detailed lesson plans that focus on a particular standard or set of standards. Learning List recently completed reviews of their materials for grades 2-12. Lessons are organized in three overarching categories: (1) Close Reading: Informational Text, (2) Close Reading: Literary Text, and (3) Writing. Close Reading instruction is presented in units focused on particular text (e.g., The Diamond Necklace) and made up of five lessons (i.e., about a week’s worth of instruction). Writing instruction focuses on writing skills (e.g., write opinions that can be supported with facts) and language skills (e.g., recognize and correct run-on sentences). LearnZillion is dedicated to championing teachers and supporting their ongoing professional development. Teachers develop expertise and insights while working with students, and have exceptional ideas for how to improve classroom learning. However, they have never been able to integrate that expertise into a curriculum that keeps getting better. LearnZillion believes that empowering teachers to collaborate and share best practices creates new possibilities for students, and the profession. LearnZillion Content Philosophy: It’s hard to teach a lesson. It’s harder to teach it well. And it’s particularly hard to teach it in a way that resonates and sticks with students. Teachers not only have to understand their content, they have to know the best way to teach it. This idea of Pedagogical Content Knowledge (PCK) – knowledge of the content and the way to make it accessible to students – is at the heart of LearnZillion. PCK has become even more important with the depth that is now required by the Common Core State Standards. Their offerings are meant to help get teachers started with lessons that were designed with PCK in mind. The resources on their site were built by a talented group of hundreds of practicing teachers (a.k.a. the LearnZillion Dream Team) for teachers everywhere. Collectively, as a community, LearnZillion will continue to improve upon these lessons, building more practical resources and PCK as they move forward. American Legacy Publishing’s Studies Weekly Texas K-5 Social Studies Series provides resources to support elementary social studies instruction in print and online formats. Content is presented in weekly student magazines that focus on developing reading skills, with a particular focus on informational texts. Student magazines are available in Spanish. Studies Weekly Magazines are delivered to schools in four quarterly installments. Each installment includes six to seven weekly units of instruction. Magazines present short blocks of age-appropriate text, vivid illustrations of historical content, writing prompts, and related games and activities. At grades K-2, Studies Weekly introduces students to important historical events and figures, social studies concepts (e.g., rules, responsibility, patriotism), and tools (e.g., timelines, maps, globes). Instruction at grade 3 focuses on the role of community and the importance of citizenship. Students learn about Texas history at grade 4 and U.S. history at grade 5. Studies Weekly also provides online resources that are compatible with iPads and interactive whiteboards. Online content includes additional “bonus” primary source materials, including paintings, illustrations, newspaper articles, and audio and video clips of important speeches and events. Bonus materials also include audio reenactments of events that present illustrations accompanied by audio dramatizations of events (e.g., the Boston Tea Party). Bonus content includes questions at easy, medium, and hard levels of difficulty. Students earn “virtual reward points” for each bonus article they read or listen to online and for each correct response to a bonus question. Students use points to purchase items for the program’s online classroom pet—Revere the Rat. Audio readers are provided and support fluency development by highlighting words in the text as they are read aloud. At K-2, audio readers also provide pronunciation support.